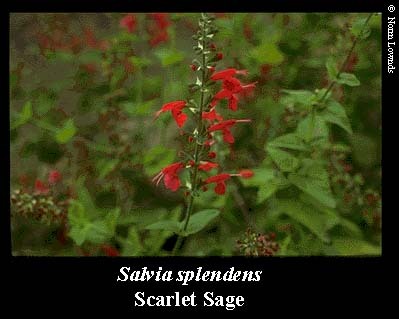 Scarlet Sage is a hardy annual to tender perennial, native to Texas, and found throughout the southern portion of the United States. In warmer climates, the variety tends to act as an annual. 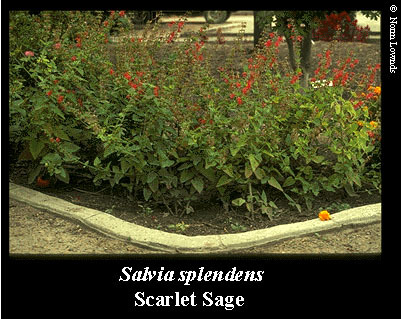 Scarlet Sage prefers sandy and gravelly soil. The various types of Salvia Spendors bear spikes of red, purple, pink or white flowers. Salvia heights range from six inches to three feet with plants spaced eight to twelve inches apart. Salvia may be grown in sun to light shade, but shade grown plants bloom later. Taller varieties bloom later than shorter varieties.